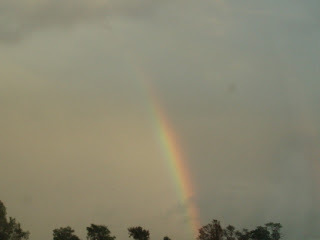 Last night when I was driving home, I saw this fabulous rainbow! 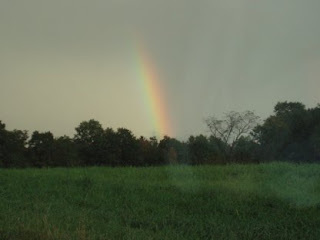 Then, just to the right of it--another fainter rainbow! 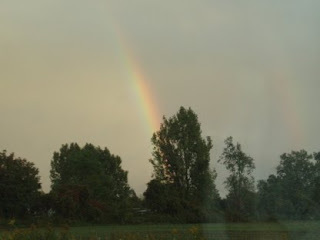 I can't remember the last time I saw a double rainbow! In the first picture, look just above the last tree to the right--see it? Mother Nature sure puts on a show! 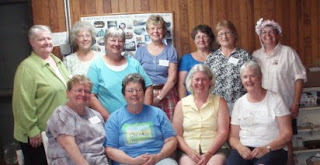 I am updating the schedule and retreat sections of my website today, so check it out when you get a chance. 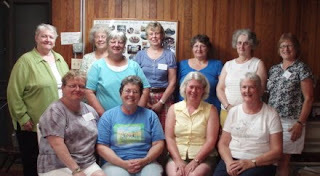 There might be a class you can't resist at a shop near you! 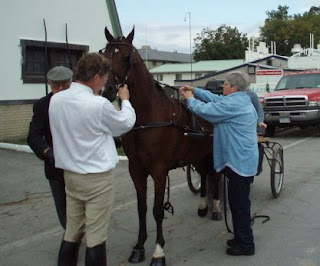 Here are pictures of us hooking the cart to the horse. In the first one, I am putting the overcheck from the bridle onto the harness. This helps keep the horse's head in the proper position. Check out Topper's hooves--I did the blacking and the touch-up on them! Oh, and I shaved his legs! 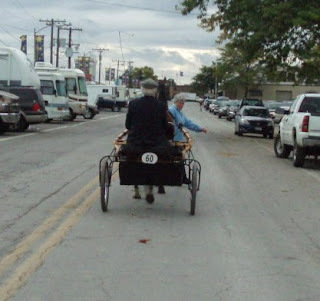 Dr. Holmes is seated in the cart, and we are ready to head to the ring. The gentleman on the left is Tim. He and his wife Katie own Kingfisher Creek Stables in Clifton Springs, New York. And here we go--off to the ring where we will win our third ribbon of the show! My job was what they call a "header"--when the class is almost over and the horses are lined up in the center, the header comes in and stands at the horse's head. We keep the horses quiet and "freshen" their manes and flick dust off them before the judge comes along, as well as encouraging them to "park out". You can see from this photo what I am talking about. This was not our class--I couldn't be in the stands and in the ring at the same time! 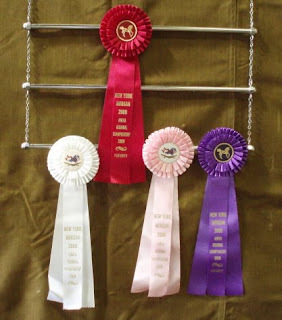 In all, we took four ribbons in four classes! 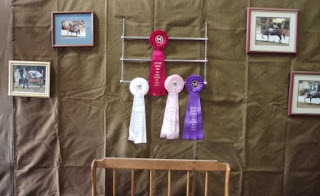 Here's a shot of the display wall with our ribbons hanging. And a close-up of the ribbons! Nice, big ribbons! Did I mention that I love ribbons? We already have a training plan mapped out for next year. I can't tell you what a thrill it was to be a part of the training and showing of Topper. We all get our heads down and keep moving, but forget to look up and try something new. It's so invigorating! Like when I went back to knitting after a 20 year lapse. So don't be afraid to step out and try something different! Who knows what I will be into next! 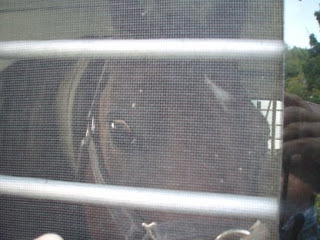 I hope you've enjoyed your vicarious journey to a horse show with me. Now I am off to teach machine piecing for the evening--life returns to some semblance of order. Til next time--keep smiling--just like you were in your right mind! 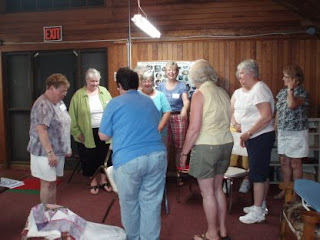 First, I have to say that all the guesses about my activities were very entertaining--wrong--but entertaining! I almost fell off my chair laughing at some of them! But I digress. 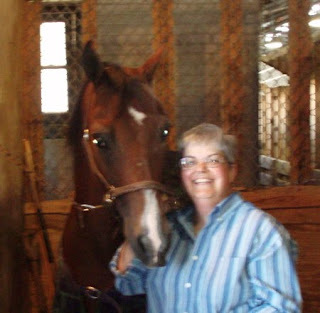 Yes, that's me with Homespun Top Note--affectionately known as Topper. 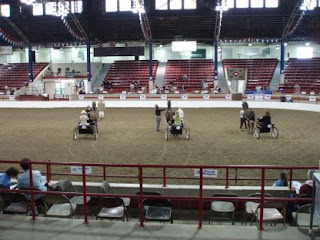 We are at the New York State Morgan Horse Society Show, which was held at the State Fair Grounds from September 16-19. Over 1000 Morgan horses were in attendance--a supreme overload for horse fans! Here I am combing out his tail. It hits the floor and then trails behind him for at least a foot! You could run a fine-toothed comb through from top to bottom when I got through! Topper both rides and drives, but over the past two months we have been concentrating on the driving aspect. I have learned to harness, hook the cart to the horse and harness, how to sand and blacken hooves, trim ears, bathe a horse...and tons more I'm probably now taking for granted. With few exceptions, we worked every day--making adjustments to harness fittings and fine-tuning the performance. 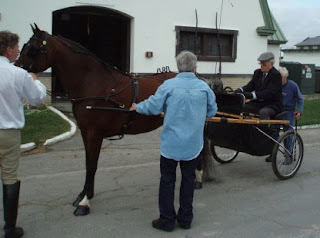 I did video almost every day so that the driver could see what was going on (behind the horse you can't see how he carries his head or his leg action). 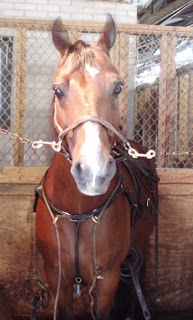 Here's Topper in the tack stall with his harness on, waiting for his bridle and showtime. 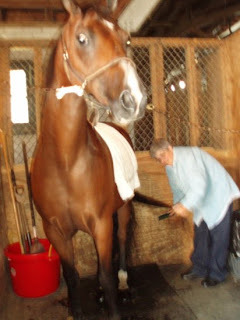 Topper is an 8-year old gelding who was bred and raised by Homespun Morgans in Groton, New York. Dr. Holmes, the owner of this horse establishment, is the vet who is keeping Lynnie healthy. At the end of our first day of showing, we had two ribbons in two classes!!!! 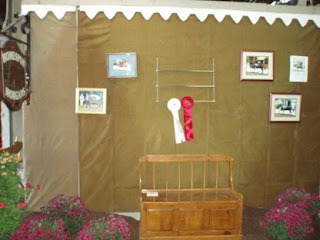 Here is the display board for ribbons, complete with a bench, flowers, and pictures of some of the Homespun horses. The little plaque on the bench came with the red ribbon! It was so exciting--being in the ring--having our number called as ribbon winners! I have to tell you that it has been so hard to keep this a secret! I felt like I was living two lives! Tomorrow: Part Two, complete with pictures of me helping to harness Topper and of us going off to a class. Unfortunately, it is impossible to take pictures while you are in a class, so some things I had to recreate afterwards, but it will give you an idea of what went on at the show. Okay, are you surprised? Disappointed? Any reaction? You're still all special--and thanks for waiting for it! I know this is so unlike me, but I probably will not be posting again until at least Saturday night. (I know, how is this any different than what I've been doing? But remember July? Still recovering!) At any rate, when I post next, it will be with an update on what I have been doing the past two months. Hint: It has NOTHING to do with quilting or knitting. You will be really surprised when you find out! You are welcome to guess in the comments, but there will be no prize, even if you are right--just the satisfaction of knowing that you were right! Hand applique, machine piecing, ironing, vacuuming (the vacuum looked vaguely familiar), and semi-cleaning my sewing rooms. Basically that means that I couldn't get in the rooms, let alone find anything. The island is still covered, but with a prepared class's stuff, an open notebook ready for setting instructions for a quilt we are finishing in an on-going class, an open Book on CD case, my lint roller, stapler, and various and sundry other items I put there as a way station. Gotta run for now. What did I tell you...I tell you what I told you--you are each special. Hold that thought until I get back to you. P.S. Are you stumped? 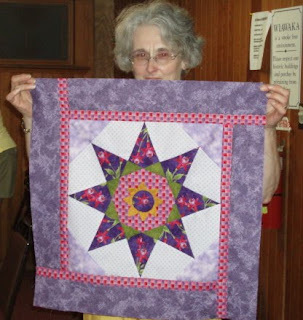 Dumbfounded that I actually would do something besides quilting and knitting? Scratching your heads over what it could be? All will be revealed next weekend! Wait for it! The winners of the Brazieres for a Cure 2009 have been announced and I can now show you my judge's choice! 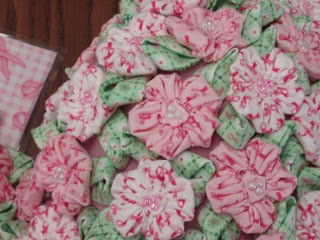 This bra was covered with yo-yo flowers in the most beautiful pinks and greens. And you've got to love the fringe! 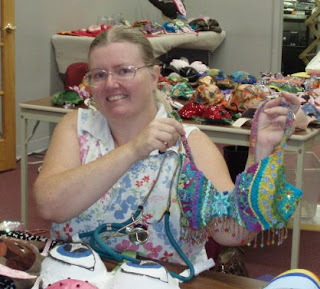 Here's a picture of the whole bra plus the lovely ribbon that Louise made. And here's the lady who started it all: Louise! With her entry--a bra totally (and I do mean totally) covered with hand embroidery. You (not me!) could easily wear this as an outer garment to rave reviews. Congratulations on a job well done, Louise! And remember, readers, there is still time to vote for Viewer's Choice and for you to bid at the auction. 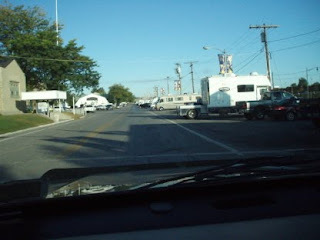 Check the schedule of events at www.Brazieres4aCure.blogspot.com. Okay, that's all the news that's fit to print for tonight. Happy back to school for the parents of school-age children. Sorry the summer's over for those teachers reading this. And fall is just around the corner--how did we get to September already! Are you remembering how special you are? And remember to be kind to those around you. Everyone is struggling with something--usually something they are good at hiding, but that a kind word or gesture helps get them through the day. Be thankful for the many blessings God bestows upon each of us every day--they are there, even when we don't think so. 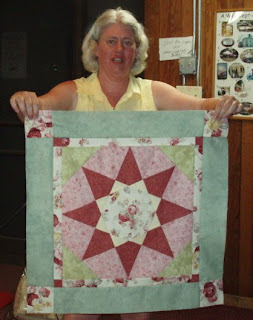 Sandy finished her top--I just love the center motif and how the other fabrics accent it. 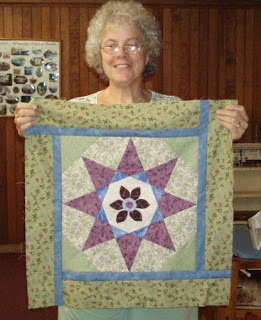 Nancy designed and hand appliqued her center. Such a soft, serene palette. Gale did three-dimensional applique on her center--the gold pieces are actually 3D petals that accentuate her fussy-cut circle. Stunning! And here they are--smiling and happy...and tired! At the end of three full days, they still were navigating and friends! Gale took this picture so that I could be in a shot as well. I'm the one with the tiara (in case you didn't know that!). After the group pictures, it was back to work! 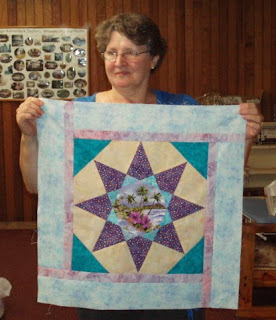 Cindy finished her top--we decided she needed a bit different set as her star had a more formal feel and we wanted to use more of the floral. And Myra worked very hard to complete her star. And she did--before the end of the third day! Ladies, WELL DONE! It was an absolutely fabulous adventure with you all. 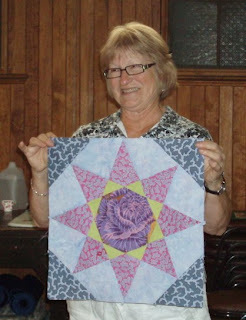 It was exciting and satisfying to see the Star of Hope take shape with so many different fabrics and colors. And the friendships and camaraderie are priceless. Many thanks for the memories! What a rush!